The paper considers a technique for setting the sampled values of a discrete, in time and state, Markovian process based on a priori known probabilistic-in-time mechanism of changing of states. A block diagram of the device realizing this technique is suggested supplemented with an example to explain the principle of operation of the device. LIPTSER, R.Sh. ; SHIRYAYEV, A.N. Statistics of Random Processes (Nonlinear Filtering and Relevant Issues) [in Russian]. Moscow: Nauka, 1974. SEGALL, A. 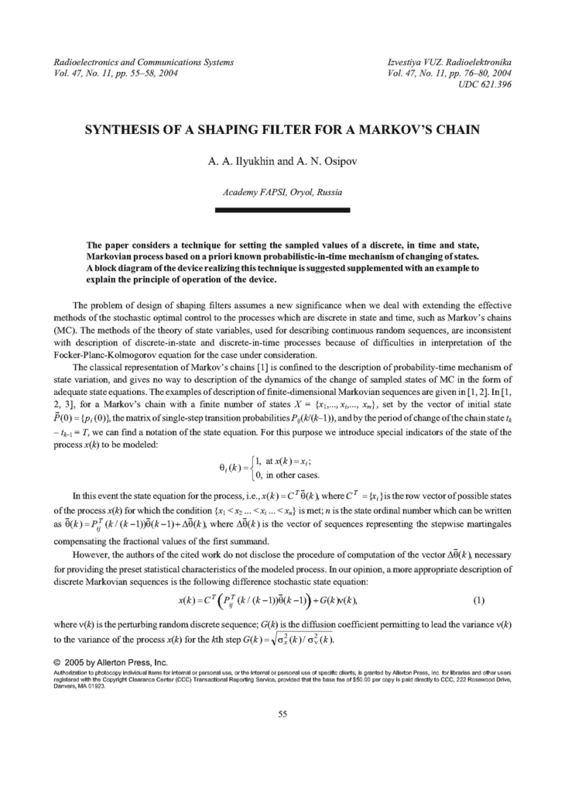 "Optimal control of noisy finite-state Markov processes," IEEE Trans. Automatic Control, v.22, n.2, p.179-186, 1977. DOI: https://doi.org/10.1109/TAC.1977.1101447. TERENT’YEV, V.M. ; PARASHCHUK, I.B. Theoretical Foundations of Control of Multichannel Radio-Communication Networks [in Russian]. Sent-Petersburg: VAS, 1995. GMURMAN, V.Ye. Probability Theory and Mathematical Statistics [in Russian]. Moscow: Vysshaya Shkola, 2000.